Yayoi the kangaroo eating vegetable cake at her first birthday party held at the Okinawa Zoo & Museum in Okinawa City on March 30. 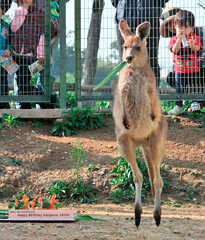 The Okinawa Zoo & Museum held the first birthday party of kangaroo Yayoi on March 30. Many parents and children took part and presented a cake made of Yayoi’s favorite vegetables and fruits. According to a member of the breeding staff Akari Shinjo, baby kangaroos or “joeys” as they are known, stay in their mother’s pouch for about half a year after their birth. A kangaroo’s age is counted from the first day it emerges from its mother’s pouch. Yayoi first popped her face out of the pouch on March 17 last year. At the birthday party, the staff presented Yayoi with the birthday cake made by children visiting the zoo. Even though Yayoi was at first afraid of the cake, which was different from the foods usually fed to her, she enjoyed eating it after a while.